This page features the latest news and updates from writer and triker Denise Lanier. She has Multiple Sclerosis, a disabling disease in which the immune system destroys the protective sheath that covers nerves. Damage causes communication disorders between the brain, spinal cord and other areas of the body. MS may result in nerve deterioration, an irreversible process, leaving some people unable to speak clearly, or even walk. Since this is a painful condition, folks who have it are very sensitive to ordinary movements and situations that most of us would not even give a second thought. If a trike is transmitting unusual vibration into the body, Denise will detect it long before the rest of us will. Thus, she needs a trike of unparalleled comfort. Denise Lanier, with Luke, her service dog. Visit her website HERE. 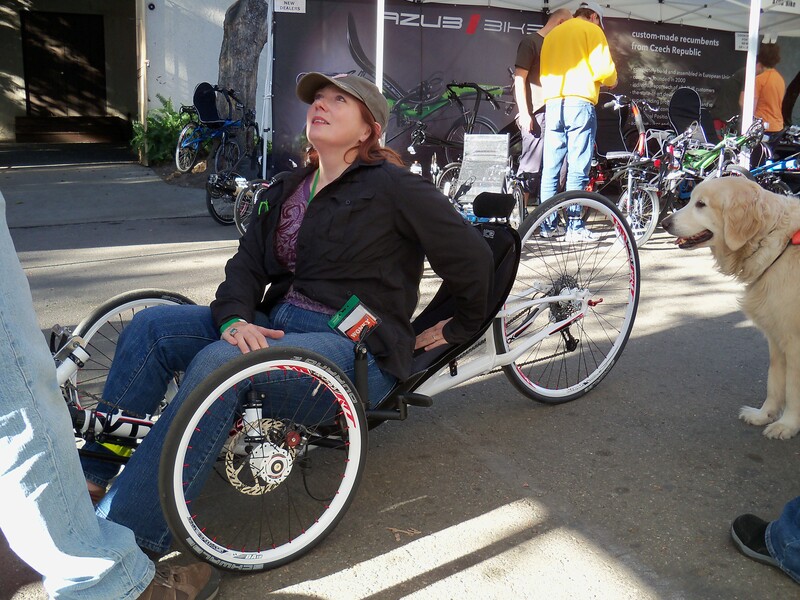 In January of 2014, Denise acquired a new ICE VTX speed trike from England. Below appears background information about Denise, and how her VTX is helping her enjoy the ride. Denise will provide photographs and personal impressions about the VTX on this page over time. This material will evolve as she spends more time out on the open road in the newly designed trike. The most recent entries on this page will occur towards the bottom, in chronological order, oldest impressions to newest. 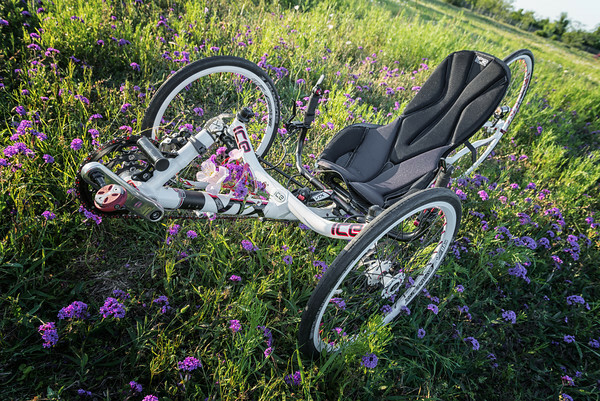 This April I’ll be participating in my 4th MS 150 and I’ll be riding the best-lookin’ recumbent trike of anybody else on the road. In my last post I gave you some sneak peeks of her loveliness. Here she is in all of her glory. My husband Gary shot these photos using a black backdrop in the dark, outside in the cold. In order to get this single photo of Xena sitting in the trike’s seat he had to shoot 23 different shots. 17 of the frames had me reaching in or out, stepping in or out, or body-blocking the shot. Said cat did not like the idea of the night chill, or the bright lights, or, ya know, being TOLD to do something (as in, you know, being told do anything). I’m a pretty good cat-wrangler, but that was one daunting and hilarious feat, let me tell you. It was worth it, though, because I really like the photo. And here’s my VTX beauty with Luke, my mobility assistance dog. 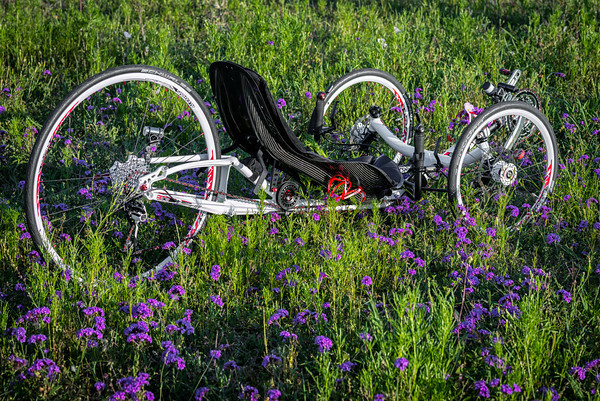 Which makes perfect sense, because my recumbent trike is my happiness, independence, go-fast freedom, adventure-seeking assistant. My two assistance partners in one photo: SWEET. This baby rides like a dream. I can hardly believe what a smooth-sailing trike the ICE VTX is. Somehow she manages to ride as heavenly as my 2006 ICE Qnt with rear suspension. If that’s not what’s called a galactic leap-forward in design, then I don’t know what is. You can read more about the design of the ICE VTX HERE in Bryan Ball’s most excellent review, and I’ll be posting more rider feedback and responses for you soon, as well, both here and on my Wonky Bent website, where there will be more reviews and photos of VTX-ness. 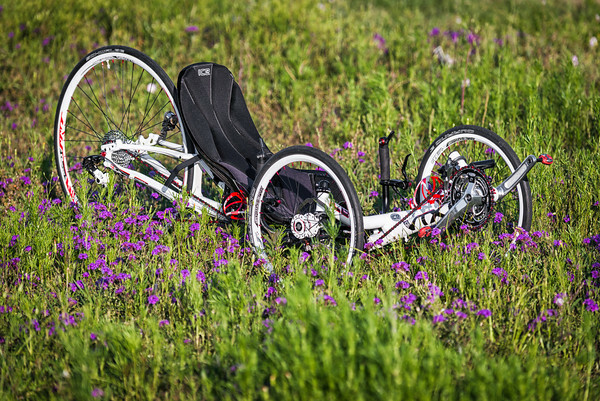 The VTX would be a fabulous trike for anybody wanting a light, sleek, quick recumbent trike (in fact, I don’t think any other offerings come anywhere close to the VTX’s performance, comfort and looks), but for those of us with illness and/or disability, I believe the VTX to be heaven-sent. I can pick her up without straining my back; I can lift her over high curbs and into the back of my car with ease; I can ride miles-&-miles without my back/hips/joints taking a beating; and she’s such a feather-weight she practically serves as a jetpack going up hills. 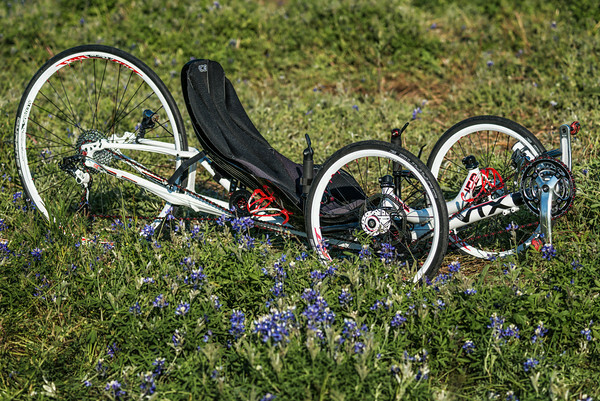 This is recumbent trike/rider true love, people. True. Love. Will you be riding the 2014 Lone Star BP MS 150? I think you should :) Alternatively, you could make me – and a whole lot of other folks – crazy-happy with a wee donation. Every little bit helps, and every little donation acts as a humongous show of support and encouragement for my efforts in the daily battle against MS and my ride towards a CURE. My donation page can be found here. I am grateful for every, single donation-gift, I can assure you.